Beetroot is one of the easiest vegetables to grow in your garden. It’s also very versatile as it can be eaten fresh, stored for a few weeks, or pickled for use many months later. It’s available in two main varieties: globe (with a round root) and long (which have a similar shape to parsnips). Beetroot grows best in partial sun or full sun, (you’ll need to water more regularly in sunny areas, so partial sun is recommended). Prepare the soil beforehand by digging it up to a depth of at least 30cm. Rake out any sticks and stones as these can harm the development of the roots. Ideally the soil should be light and friable – very heavy clay soil will inhibit the development of your beetroot plants. Sow beetroot seeds in rows 30cm apart, at a depth of about 3cm. Keep the soil moist until the seeds have germinated and you can see the seedlings peeking out from the soil. When the seedlings are about 5cm high, thin them out to their correct spacing – about 10cm for the globe variety and 15cm for the long variety. Globe varieties should be harvested when the diameter of the root reaches 7.5cm. Long varieties take longer to develop can be left in the ground until they are about 15-20cm long. 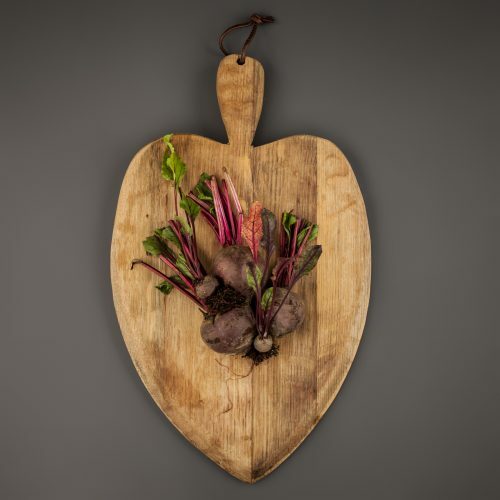 When harvesting, gently dig under the root with a trowel, taking care not to damage the root, as this affects how long you will be able to store your beetroot. Did you know? Beetroot leaves are also edible. Add them to salads instead of lettuce, or use them as a substitute for spinach.